A Buddhist merit making ceremony took place on November 7 at the Royal Princess Chiang Mai Hotel in honor of the hotel’s 24th anniversary. 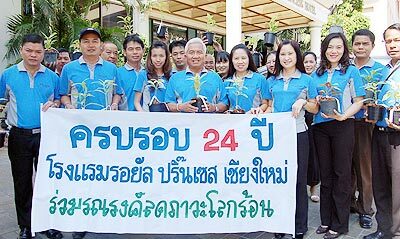 Amnuay Wanpen, center, General Manager, the management team and hotel staff participated in the ceremony and later donated live plants to nearby shops and public areas. 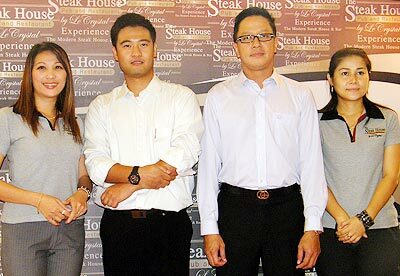 Ajava-Riddhi Diskul, 2nd left, co-Managing Partner of AARD, was introduced as the new managing director of both the French restaurant Le Cuisine on Paton Road and the Steak House Pub & Restaurant at JJ Market on November 5. With him, are Ms. Orawan Suramana, left, Operation & PR, M.L. Anuwat Jayanta, 2nd right, consultant and co-Managing Partner and Ms. Khanisorn Sakulsang, Sales & Marketing, far right. Shuanglung Tour, a new joint venture between business operators in Thailand and China, opened their new showroom and offices at the Tawan Trendy Mall in Chiang Mai. 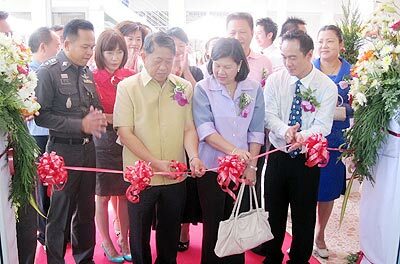 The opening ceremony, which took place on November 30, was presided over by Thongchai Wongrianthong, 2nd left, Mae Hong Son’s former governor. He is seen here cutting the ribbon for the official opening of Shuanglung Tour office. With him, are Shuanglung Tour’s owners and guests. The company offers tour packages and features OTOP products from the North in their showroom.